with respect to sustainability education. adverse impact on community or environmental well-being. require four planets to meet this level of consumption. as the Millennium Development Goals (MDGs). human happiness and the well-being of all life forms” (p. 64). 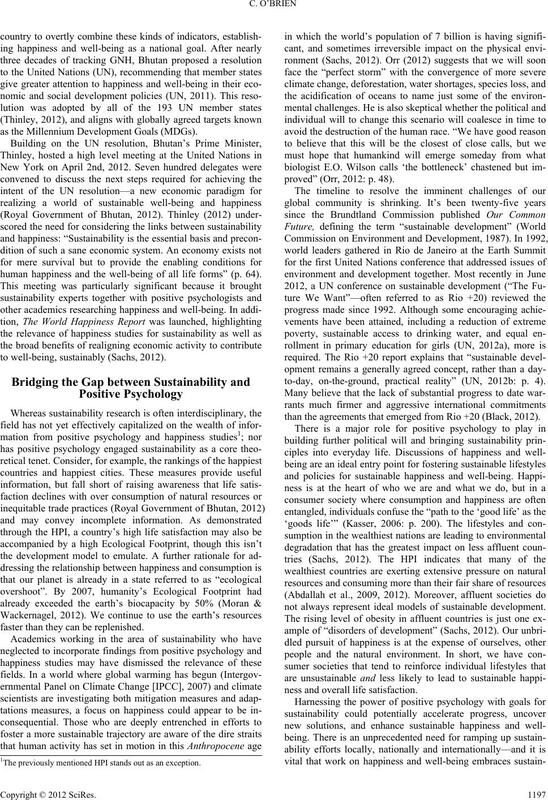 to well-being, sustainably (Sachs, 2012). faster than they can be replenished. proved” (Orr, 2012: p. 48). to-day, on-the-ground, practical reality” (UN, 2012b: p. 4). than the agreements that emerged from Rio +20 (Black, 2012). not always represent ideal models of sustainable development. ness and overall life satisfaction. 1The previously mentioned HPI stands out as an exception. nations do not flourish in isolation. creases in happiness” (Lyubomirsky, 2007). i.e. physical, emotional, social, spiritual, ecological well-being. ual, community, and global well-being (O’Brien, 2010a). wise be made by motorized transportation. to everyday life (O’Brien, 2010a). need to justify how it intersects with approved curricular goals. Who/What Is Teaching Us about Happiness? teacher education and contributing to curricula development. and sustainable happiness into teacher training. 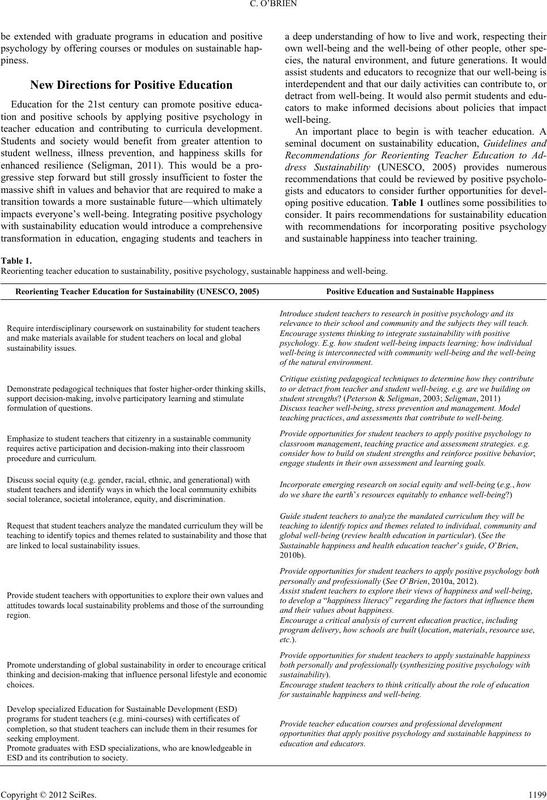 Reorienting teacher e ducation to sustainability, positive psychology, sustainable happiness and well-being. relevance to their school and community and the subjects they will teach. teaching practices, and assessments that contribute to we ll-being. classroom management, teaching practice and assessment strategies. e .g. engage students in the i r own assessme nt and learning goals. social tolerance, societal intolerance, equity, and discrimination. are linked to local sustainability issues. personally and professionally (See O’Brien, 20 10a, 2012). and their values about happiness. for sustainable happiness and well-b eing. ESD and its contribution to society. ville & Rae, 2012; Seligman, 2011). Abdallah, S., Thompson, S., Michaelson, J., Marks, N., & Steuer, N.
cost the earth. London: nef. Abdallah, S., Michaelson, J., Shah, S., Stoll, L., & Marks, N. (2012). olds. New York: Open University Press, McGraw-Hill Education. wellbeing compatible? The role of values, mindfulness and lifestyle. Social Indicators Resea rc h, 74, 349-368.
doing? First report of the Institute of Wellbeing. Conoley, C., & Conoley, J. (2009). Positive psychology for educators. 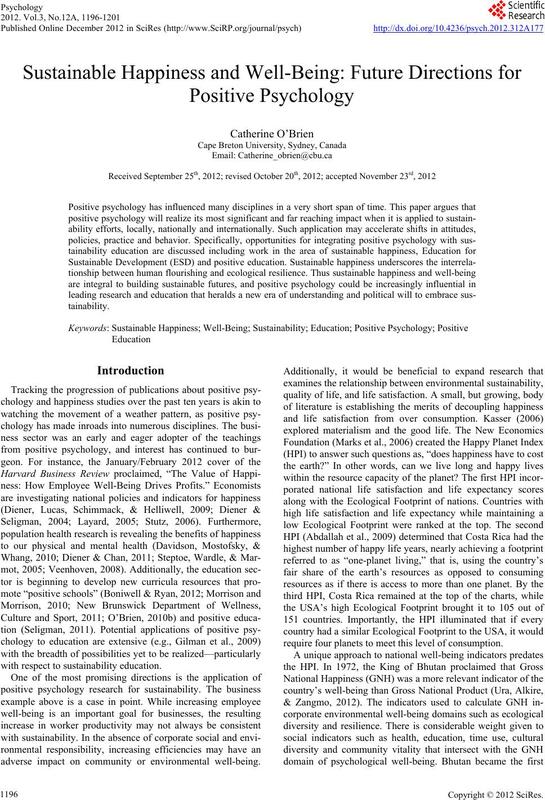 tive psychology in schools (pp. 463-476). New York, NY: Routledge. being for public policy. New York: Oxford University Press. Health and Well-Being, 3, 1-43.
positive psychology in sch o o ls. New York: Routledge. ton: Harvard Business Publishing . Howard, P. (2011). Who will teach the teachers? In K. Bartels, & K.
Parker (Eds. ), Teaching sustainability, teaching sustainably (pp. change 2007: The physical science basis. IPCC Secretariat. C.P.N. chology themes in school health. how of happiness: A scientific approach to getting the life you want. well-being. Philidelphia: Jessica Kingsley Publishers. Moran, D., & Wackernagel, M. (2012). Measuring sustainability. In J.
forever (pp. 27-35). Illinois: Common Ground Publishing. ing positive mental health: Better practices and perspectives. New Brunswick Department of Wellness, Culture and Sport (2011). Mental fitness: From evidence to action. of Sustainability Edu cation, 1. Orr, D. W. (2012). Can we avoid the perfect storm? Solutions, 3. Ramanathan, S., O'Brien, C., Stone, M. R., Faulkner, G., & Cook, L.
the lives of 8- to 18-year-olds. Kaiser Family Foundation Stud y.
Bhutan to the United Nations. Thimphu: Office of the Prime Minister. Seligman, M. (2011). Flourish. Toronto: Free Press. Series No. 10, Tellus Institute. 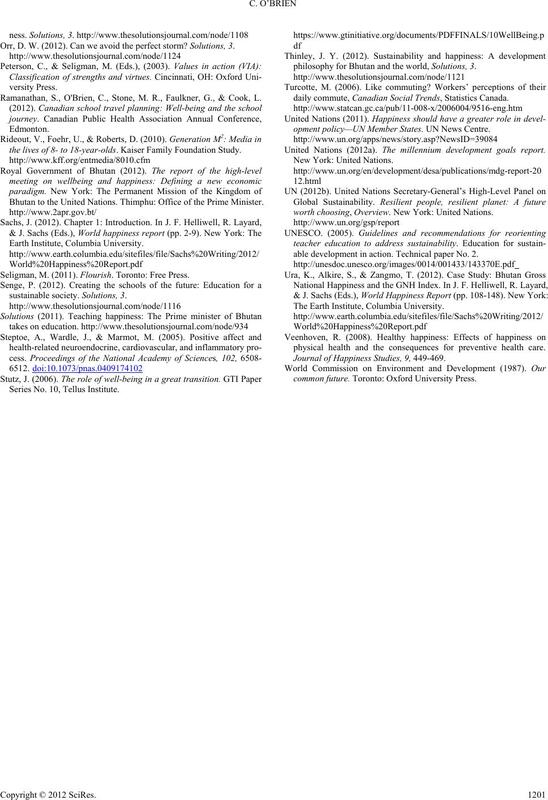 philosophy for Bhutan and the world, Solutions, 3.
daily commute, Canadian Social Trends, Statistics Canada. opment policy—UN Member States. UN News Centre. United Nations (2012a). The millennium development goals report. worth choosing, Overview. New York: United Nations. able development in action. Technical paper No. 2. The Earth Institute, Columbia University. physical health and the consequences for preventive health care. Journal of Happiness Studie s, 9, 449-469.
common future. Toronto: Oxford Universit y Press.